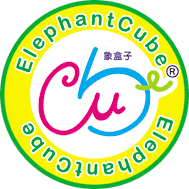 ElephantCube® is a Taiwan based company. The firm was founded and established by an English teacher who loves teaching children. We strive for excellence in making fun, functional and quality products to help children learn. We have chosen the Elephant as our logo because the elephant symbolizes wisdom and strength. Third party testing & certification: We only use non-toxic materials. All ElephantCube® products are tested by BSMI (Bureau of Standards, Metrology & Inspection) to meet or exceed toy safety standards. We welcome suggestions and feedback! Thank you for visiting our site!